Naruto: Gekijouban Naruto: Dai Koufun! Mikazuki-jima no Animal Panic Datte ba yo! 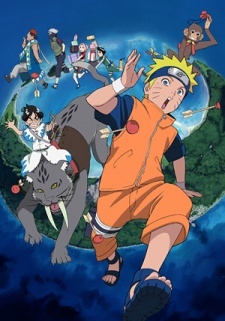 Naruto, Kakashi, Sakura, and Lee are sent to protect a prince during his trip around the world and see that he returns safely to his home in the Moon Country. The Moon Country happens to be really rich and as such the Prince tends to buy anything his heart desires, during his travels the Prince would come across a circus group that features a rare Sabre-toothed tiger that he just had to have. So he purchased the entire group. Suddenly a mission to protect just the spoiled prince that hardly listened to anything said, turns in to a mission to look after aimals and a prince that doesn`t listen to what they say, and in the end somehow get them all back safely to their home country. All the while there are three mysterious Ninja wielding some frightening jutsu waiting for them. Why are they attacking them? What do they want with Team Kakashi!? !